Have you wondered if there is a benefit in terms of tax rates to being taxed at the personal rate as opposed to the corporate rate? The top personal rate is 35 percent (for income over $372,950). And the top corporate tax rate is also (effectively) 35 percent. So does it matter whether your business is taxed at the personal rate or the corporate rate? We looked at the corporate tax tables and assumed federal income taxes at the corporate rate and the personal rate for (a) single filers, (b) a married person filing jointly with a spouse, and (c) a married person filing as single. We also assumed that this person/couple had no other income and that the income was the total taxable income, after all, exemptions and deductions. We didn't go higher than $500,000 because the numbers don't change until you get up to $10 million in income for a corporation. At the lower income levels ($40,000 and $100,000) there is no appreciable difference between the taxes for individuals and corporations. But at the higher level of $500,00, the corporate tax is almost twice the level of the personal tax. So, if your business is going to be making a significant income, you should be using the s corporation filing status or having your LLC taxed as a partnership. 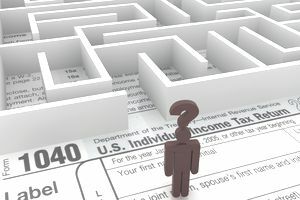 Of course, there are other considerations, such as personal exemptions, tax credits like the Making Work Pay credit, self-employment taxes, the earned income tax credit, and the cost of incorporating, that need to be taken into account. We always hesitate to draw conclusions; you should talk with your tax adviser and legal adviser before you make any decisions about business legal type. Note: We used the current year's personal tax rates from William Perez's Tax Planning site for the personal tax calculations, but he isn't responsible for any miscalculations on my part. Disclaimer: Author is not a tax accountant, CPA, or tax preparer. Estimates are for general information purposes only. Individual circumstances can cause these numbers to change. Please see your tax professional for more detailed estimates.